EPA Administrator Scott Pruitt answers a question during an interview with Reuters journalists in Washington, Jan. 9, 2018. 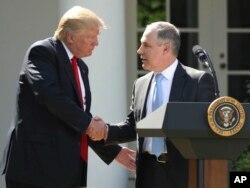 The agenda, laid out by EPA Administrator Scott Pruitt in an exclusive interview with Reuters on Tuesday, marks an extension of the agency's efforts under President Donald Trump to weaken or kill regulations the administration believes are too broad and harm economic growth, but which environmentalists say are critical to human health. "The climate is changing. That's not the debate. The debate is how do we know what the ideal surface temperature is in 2100? ... I think the American people deserve an open honest transparent discussion about those things," said Pruitt, who has frequently cast doubt on the causes and implications of global warming. Pruitt said among the EPA's top priorities for 2018 will be to replace the Clean Power Plan, former President Barack Obama's centerpiece climate change regulation which would have slashed carbon emissions from power plants. The EPA began the process of rescinding the regulation last year and is taking input on what should replace it. "A proposed rule will come out this year and then a final rule will come out sometime this year," he said. He did not give any details on what the rule could look like, saying the agency was still soliciting comments from stakeholders. He said the agency was also planning to rewrite the Waters of the United States rule, another Obama-era regulation, this one defining which U.S. waterways are protected under federal law. Pruitt and Trump have said the rule marked an overreach by including streams that are shallow, narrow, or sometimes completely dry — and was choking off energy development. Pruitt said that in both cases, former President Barack Obama had made the rules by executive order, and without Congress. "We only have the authority that Congress gives us," Pruitt said. Pruitt's plans to replace the Clean Power Plan have raised concerns by attorneys general of states like California and New York, who said in comments submitted to the EPA on Tuesday that the administrator should recuse himself because as Oklahoma attorney general he led legal challenges against it. Pruitt said he hoped for legislative reform of the U.S. biofuels policy this year, calling "substantially needed and importantly" because of the costs the regulation imposes on oil refiners. The Renewable Fuel Standard, ushered in by former President George W. Bush as a way to help U.S. farmers, requires refiners to blend increasing amounts of biofuels like corn-based ethanol into the nation's fuel supply every year. "That to me is something very tangible very important that we can achieve for the American people," he said. 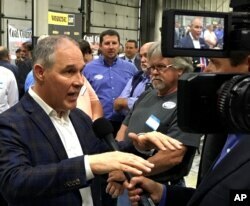 EPA Administrator Scott Pruitt, talks to a reporter after speaking at Whayne Supply in Hazard, Kentucky, Oct. 9, 2017. Pruitt added that EPA also is continuing its review of automobile fuel efficiency rules, and would be headed to California soon for more meetings with the California Air Resources Board to discuss them. California in 2011 agreed to adopt the federal vehicle emission rules through 2025, but has signaled it would opt out of the standards if they are weakened, a move that would complicate matters for automakers serving the huge California market. In the meantime, Pruitt said EPA is continuing to reduce the size of its staff, which fell to 14,162 employees as of Jan. 3, the lowest it has been since 1988, under Ronald Reagan when the employment level was 14,400. The EPA employed about 15,000 when Obama left office.